Pests - are they affecting your life, your property, or your ability to enjoy the yourself? If yes then we are here to help - today, tomorrow or at a time that suits your busy schedule. 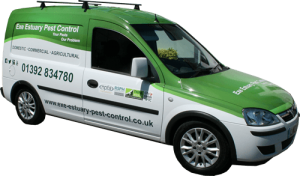 If you want that pest problem resolved then don't read any further give us a call and let us take the problem away. Exe Estuary Pest Control is an independently owned Exeter based company delivering a local, responsive, reliable and friendly pest control service on hand at all times for the removal and eradication of your pest problems in the Exeter, Exmouth, Sidmouth, Honiton, Tiverton, Okehampton, Ashburton, Newton Abbot, Torquay, Dawlish and all surrounding towns and villages. "Have found this company to be very friendly and helpful. I particularly like the attitude to protecting wildlife – birds etc from poison." 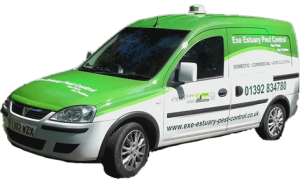 "A very efficient and professional service, with quick response and follow up. Thank you"
"All are gone, I can’t believe it. I will certainly recommend you to my friends and colleagues, such a brilliant service." "I was very pleased with your visit here and would recommend you to my friends".